The "ROVALution" moved one step closer to reality on Monday at Founders Hall in uptown Charlotte, North Carolina. 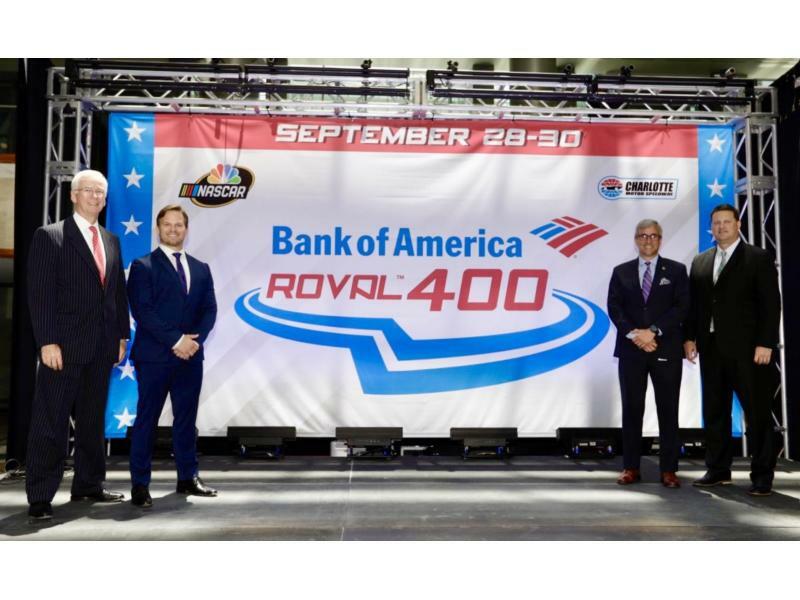 Charlotte Motor Speedway joined Bank of America and NASCAR in revealing the striking logo for the Sept. 28-30 Bank of America ROVAL™ 400 race weekend - the first playoff road course races in NASCAR history and the longest road-course race in NASCAR. Bojangles' Qualifying on Sept. 28 and the Sept. 29 Drive for the Cure 200 presented by Blue Cross Blue Shield of North Carolina are among the can't-miss events fans will witness at the the inaugural Bank of America ROVAL™ 400 weekend on NASCAR's newest track. The Monster Energy NASCAR Cup Series' biggest stars will duel for 109 laps on a 2.28-mile, 17-turn road course oval that serves as the cutoff race for the first round of the Playoffs. "We've taken one of NASCAR's most storied ovals, in Charlotte Motor Speedway, and we've created something entirely new," said Marcus Smith, the president and CEO of Speedway Motorsports, Inc. "I've got to give a huge thanks to everyone at Bank of America for being such a great partner. Thanks to everyone at NASCAR as well. This is a great opportunity for everybody in Charlotte to come out and witness one of the greatest events in our area." 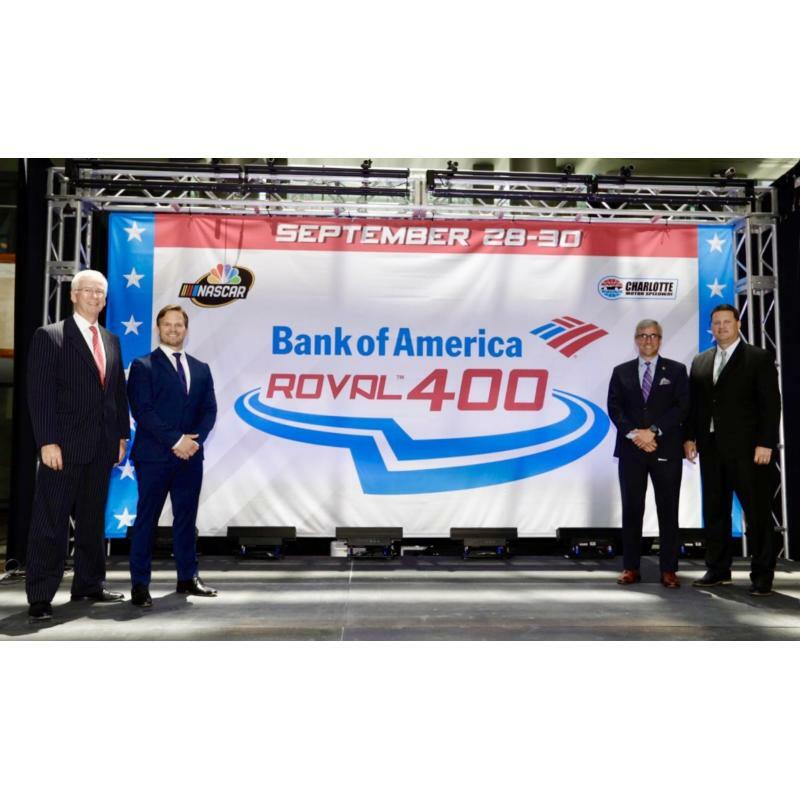 Steve O'Donnell, NASCAR's executive vice president and chief racing development officer, said the Bank of America ROVAL™ 400 promises to deliver plenty of exciting action for drivers, teams and fans. "This feels right," O'Donnell said. "It's a great distance and it's going to provide action throughout the race. One of the things that you look at in the Playoffs, especially for Charlotte since we've raced here a long time, is that you have a lot of drivers and teams who have their notebook and know how to race this track. That changes when we go into this race. I think that's what fans want to see. They want to see something unique, which is what Marcus and his team have put together." Charles Bowman, Bank of America's market president for North Carolina and Charlotte, said the announcement added another chapter to Bank of America's partnership with Charlotte Motor Speedway. "Bank of America is so proud to be a part of this, for a number of reasons," Bowman said. "First of all, our friends at Charlotte Motor Speedway have been with us for a number of years. 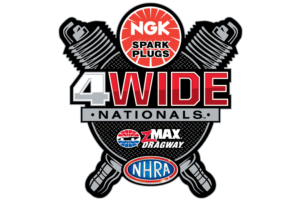 It's that association, friendship and network that we've had over a long period of time that makes us delighted and excited to be a part of this new adventure in racing." Speedway officials also revealed a new logo and race length for the 55-lap, 200-kilometer Drive for the Cure 200 presented by Blue Cross Blue Shield of North Carolina on Sept. 29 which will follow Bojangles' Qualifying on Friday afternoon, Sept. 28. Prior to race weekend, fans can watch drivers test the ROVAL™ at Test Fest, a pair of FREE day-long shakedowns featuring the Monster Energy NASCAR Cup Series field, from 9 a.m.-5 p.m. on July 10 and 17. Fans can also enjoy mechanical bull rides, food and drink and test-drive their race weekend seats during the tests from the Whisky River frontstretch area. In addition, fans who have purchased Bank of America ROVAL™ 400 tickets will get to experience the ROVAL™ from behind the wheel on Saturday, July 14. Charlotte Motor Speedway will allow ticketholders to drive their personal cars three laps around the innovative new course from 4 p.m.-8 p.m.